Paul Anderson facilitated a workshop session on “Online Research and Technology Transfer Expertise Systems” at the IWMW 2003 event. In this post he looks back at the session and the event held at the University of Kent. The early 2000s was an exciting time, not only for the Web, but also at the interface between academia and the business community. In 2003, I co-ran a session at the IWMW 2003 event on using the Web to publish information on research projects and how they might connect with businesses. 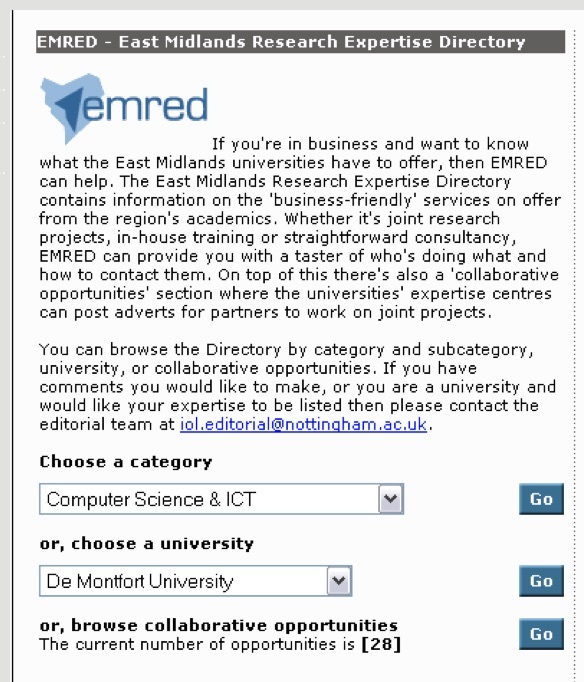 This included demonstrating my institution’s own beta, EMRED, The East Midlands Research Expertise Database (see screenshot). At the time I was a project manager at the University of Nottingham, which had been pioneering the idea of reaching out from research into the wider business community. Although quite a few universities were starting this kind of engagement, a particular innovation at Nottingham was to use European Regional Development Fund (ERDF) grants to help local businesses connect with the university (Nottinghamshire was eligible because of the collapse of coalmining). These funds allowed the university to implement a number of programmes to support access to research, one of which was EMRED, a database of academics and their projects, particularly ones that had potential for links with business. The goal was an easy-to-use system that translated ‘academic speak’ into language that a business owner or manager could understand. Although initially focused on Nottingham, in 2002-3 there were moves to widen the database to the East Midlands region, bringing in a number of other universities through the East Midlands Universities Association (EMUA). The early 2000s were a fruitful time to be engaged in this kind of knowledge transfer work. The Government wanted ladders into the ivory towers and was putting policy pressure on the universities to engage, with the Regional Development Agencies (RDAs) driving the agenda. The catalyst was the publication of two white papers, “Our Competitive Future: Building the Knowledge Driven Economy” (1998) and “Excellence and Opportunity: a science and innovation policy for the 21st century” (2000). Initiatives such as the Higher Education Reach Out to Business and the Community Fund (HEROBC) and the Higher Education Innovation Fund (HEIF) soon began to flow. All this activity, in a then rather overlooked area of university life, soon became known as the ‘third stream’ (teaching and research being the others). It was also an exciting time to be involved in the Web, despite the dot.com bust, with everybody starting to get broadband access, Web 2.0 and social media about to explode, and new technologies such as the Semantic Web and XML emerging. Looking back, however, one can also see how quickly the Web changes. Everybody was very excited about portals in the early 2000s, an idea that is barely mentioned in the age of app. 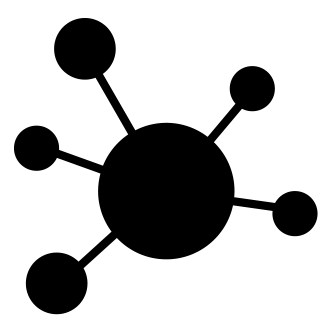 EMRED itself was planned to be part of a wide eco-system of innovation-related portals. Indeed, as part of the work we published a paper describing aspects of the project as a Vortal (a vertical industry portal), a word long forgotten (although it is in OED!). My recollection of the IWMW 2003 event held at the University of Kent is that we had quite a large and enthusiastic group of people, many of whom had also been asked by their institution to start to think about responding to the changing policy environment. In particular, many universities wanted to have far more electronic data on research activities, to help with the third stream, but also to support the research assessment exercises. After a brief introduction into the work we had been doing at Nottingham, the session became a discussion of various aspects of this kind of project, including debates about ontologies, indexing, European initiatives and, of course, types of technology. EMRED itself was built using SQL Server, XMLHTTP ActiveX control, and Active Server Pages (ASP). It is probably not a surprise if I say that one of the debates at the session was why we were using Microsoft and not open source solutions such as PostgreSQL. One of the things I do clearly remember is that the conference included a tour of the famous medieval cathedral, which was a pleasant break from the debates on ontologies. I also seem to vaguely recall a conference dinner with rather a lot of wine and a hilarious after-dinner turn by the head of Kent’s computing service (but don’t quote me on that). A final nice touch was that all the conference speakers received a copy of the Canterbury Tales. Although I left the university in 2004, I have remained mostly involved in higher education related projects and have attended several IWMW meetings since then. I believe EMRED morphed into the East Midlands Knowledge Network in 2009. In the intervening years a lot has happened in university knowledge transfer and the third stream is now a firmly embedded feature of university life. 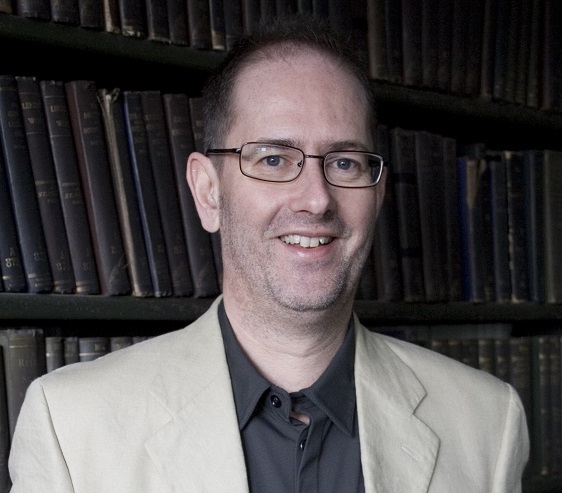 Paul Anderson was a project manager at the University of Nottingham in the early 2000s. In 2004 he left to help run JISC’s Technology and Standards Watch service. In 2012 his book, Web 2.0 and Beyond, was published by CRC Press. He now works as a freelance technical author and editor.